This beautiful villa has a plot of 1100 square meters with garden and swimming pool. The spacious terrace has sea views and gives access to three of the four bedrooms. There is also a recreation room of 70 m2 with table football, billiards, TV room and a full fitness area with the necessary equipment to keep fit. There is Wifi throughout the house and a private garage for two cars. 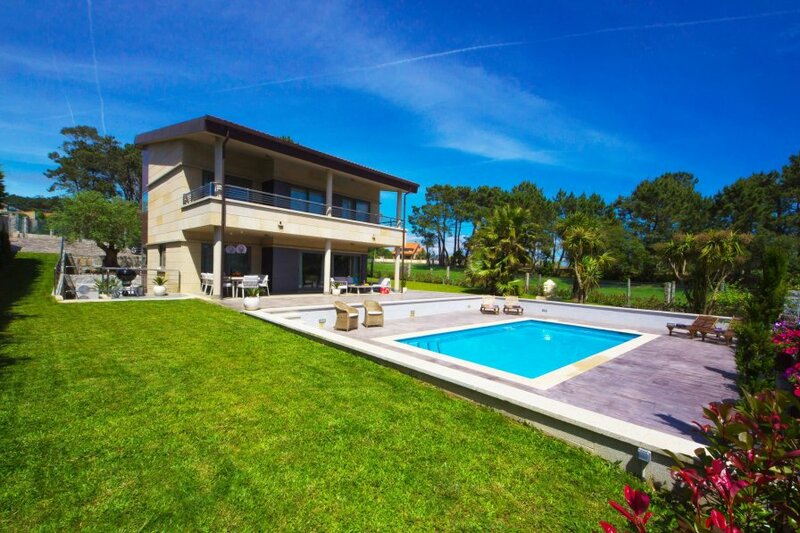 The house is located in the municipality of Sanxenxo, where you can do many activities such as karting, water sports, horse riding, boat rental, visit to the island of Ons, Toxa Casino and the prestigious A Toxa and Monte Castrove golf courses. It has a special microclimate, which is without any doubt the best climate in the region. Beautiful sandy beaches such as Montalvo, Bascuas, Silgar, Major, Paxariñas, Canelas, Caneliñas, Baltar and A Lanzada are only a few km away. The perfect house on the perfect place for a relaxing holiday and to fully enjoy the sun, beach, food and Galician hospitality.